Last year, Israel’s parliament announced plans to run entirely off solar energy by the end of 2014, but it turns out the Knesset is going even further to clean up its act. The new “Green Knesset” project will completely overhaul its ethos to stand as a symbol of the country’s environmental revolution. Israel has long been a pioneer in clean technology, renewable energy, and water conservation, but for the longest time, so many of the nation’s brilliant inventions, such as BrightSource Energy’s utility scale solar energy plants, were shipped elsewhere. The nation that spurred such smart ideas was not yet ready to incorporate them. But that has appeared to change, and in a big way. While there is no question that the pursuit for oil and natural gas will always be Israel’s achilles heel, at last the nation’s leadership has embraced the wisdom of exploiting renewable sources of energy and conserving natural resources that do exist, including water that is in such short supply. 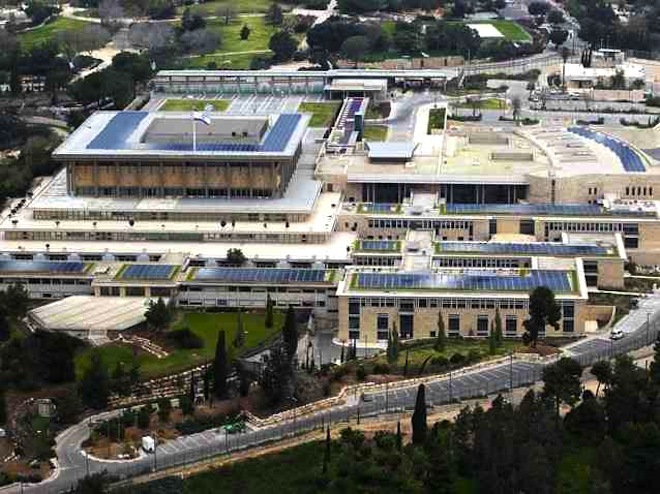 At the turn of the new year, the Knesset unveiled an outline of their Green Knesset project, which broadly aims to teach everyone who works in and around the parliament building to act in a manner that is ecologically, economically and socially sustainable. While critics will no doubt find fault with this plan given the prevailing political conditions, there is something quite radical and fresh about the government’s intention. In addition to implementing 12 specific projects in 2014 and 2015 that will reduce the building’s energy and water consumption, including a 48,000 square foot solar field, replacing all existing bulbs with more energy efficient LED lights, switching out the current air conditioning system with a new energy center and recycling water produced during air-conditioning for use in irrigation projects, the Knesset will actively engage employees and Knesset members in a systemic reconstruction. Computers will be programmed to shut down every night and studies will be conducted to improve the irrigation system on the grounds to optimize conservation, and this won’t happen in the shadows. Everyone will be involved in order to create a new culture of sustainability. This same culture will hopefully follow people home and spread like a fan to the rest of the nation until conserving water and energy and recycling becomes as natural to Israelis as breathing. $2 million will be set aside in the Green Fund to finance the Knesset’s greening, and new energy and water conservation measures are expected to save $290,000 per year. I’ll say this for the Israeli government; unlike governmental leaders here in the US, the Israelis lead by example when it comes to promoting environmentally friendly policies. Here in the US, our politicians are keen on enacting laws which affect others but not themselves such as requiring car companies increase the fuel efficiency of their fleets while they still drive around in gas guzzling SUVs and limousines. It’s truly sickening.